"I'm going to run away and join the circus!" Did you ever utter those words as a child? I must admit, it's nothing that I ever threatened as a child. These days, as much as I might like a little vacation every now and again... well, motherhood can feel quite like the circus anyway, can't it? The craziness is all around us, and we're much like a ringmaster trying to reign it all in. Or are we more like the animal trainers trying to keep the creatures calm and cared for? The exact role is questionable, but the sentiment is all the same! Motherhood IS the circus! Of course, I only joke... but the idea of joining the circus is a fun one to think about, isn't it? It begs the question... what would you choose? Would you call on that motherhood experience and take on the all important ringmaster role? Would we seek to bring smiles onto the faces of all who came to see the show in our role as a clown? Or would we perform daredevil stunts that has the crowd on the edge of our seats? Or maybe you'd choose a more supporting role that allowed you to see the reactions and excitement of the fans up close and personal like the cotton candy vendor! Hey, EVERYONE loves that guy, don't they!? To me, the trapeze artists have always been the most fascinating. Now listen, I'm not very graceful, I'm afraid of heights and I hate having attention on me... but hey, we're talking about dreams here, aren't we? So, if I could perform in ANY role in the circus regardless of given skills... well, that's the one I'd want! I would fly high above the crowd showcasing my grace and strength. I would show fearlessness as I performed these stunning acts that are not just beautiful to watch, but entertaining too. I would wear sparkly costumes and enjoy every minute as I traveled from city to city seeing the country in a unique way. Oh how fun that would be! Doesn't this look absolutely amazing? This is the first of the Disney classics being redone and released this year... and personally I think it looks like it could very well be the best! Now, don't get me wrong Aladdin and The Lion King are two of my all time Disney favorites so I'm excited to see them too, but I think Tim Burton's style is going to really make this one a fantastic tale that we're going to want to watch time and time again. And I cannot WAIT! Thankfully, the wait ends soon. If YOU could join the circus, what role would you take on? 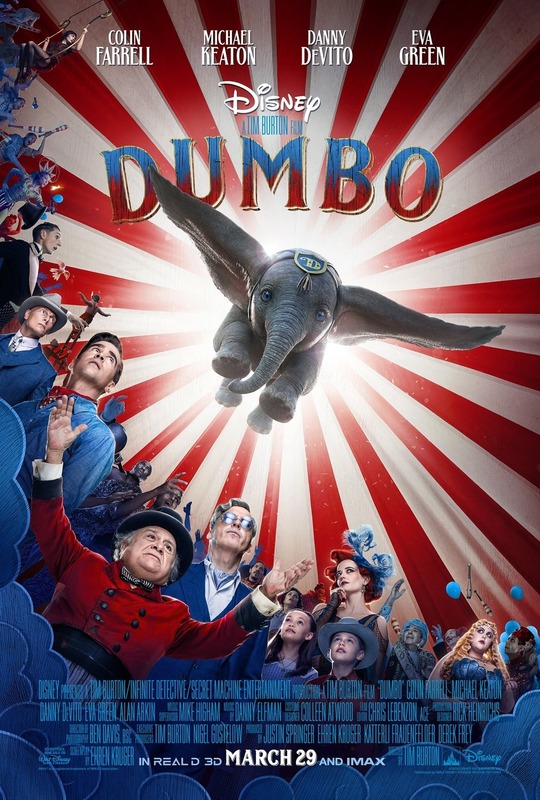 Are you looking forward to the new Dumbo movie?